The fruitful development of the English Anthem in the 20th century was made possible, some say, by the interest in the genre from composers who were unencumbered by church appointment. The Victorian flowering of English Anthems by Stanford was passed on to his student and successor at Cambridge, Wood, and other students Bainton, Ireland, Harris and Howells. Britten studied under Ireland at the Royal College of Music, and others studied at Oxbridge, Oxford and Cambridge. 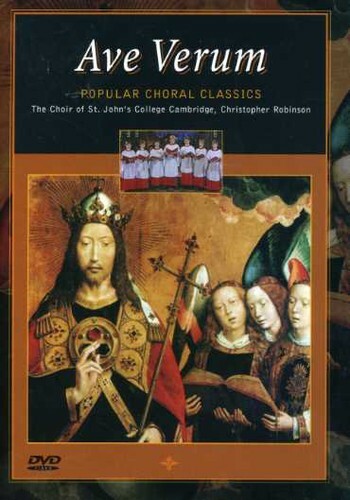 Stephen Cleobury directs the acclaimed 33-member, all male Choir of King's College in their renditions of these 13 pieces. Charles Wood's "Hail, gladdening light," Edgar Bainton's soaring "And I saw a new heaven," John Ireland's "Greater love hath no man," Wm. Harris' "Faire is the heaven," Edward Naylor's "Vox dicentis: Clama," Britten's "A Hymn of St. Columbia," Leighton's "Let all the world in every corner sing"... this is not easily performed material, but the Choir effortlessly reaches the high scales and challenging harmonies. Light organ accompaniment on most songs, but the focus is on the voices. Dramatic, operatic compositions wonderfully performed by one of England's finest choirs.